Cyprus is related to Sebastopol, but uses a double-nine set of dominoes. 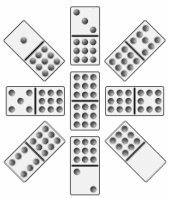 The player holding the double-nine places the first domino. If no one has the 9-9, all players draw a tile, until the 9-9 appears. Play proceeds to the left (clockwise). Each player adds a domino to an open end of the layout, if he can. The four edges of the double-nine, as well as the four diagonals, must be filled before any other tiles may be layed down. If a player cannot connect to the 9-9, he must draw a tile, then play it if possible, or pass if not. Once the initial 9 tiles are set, play continues as in standard Block Dominoes, with like-numbered tiles connecting. Doubles are played inline. A player that cannot make a move must draw a tile from the boneyard. He must play the drawn tile if he can, or pass if he cannot. A hand ends either when a player plays all his tiles, or when a game is blocked, at which time the lightest hand wins total of his opponents points, minus any points in his own hand. A game is generally played to 60, 100, or whatever total is agree upon before the game begins. Pagat.com calls for leaving at least one tile in the boneyard.